So which finance director is telling the truth? I do know that the SFSD rearranged their capital outlay levees, but the disparity is strange. I also wonder if they plan to pay off the bonds a lot faster in RC? The city’s railroad quiet zone task force will meet next week to discuss funding for the project. A final report is expected within the next two months. City officials will need to file a notice of intent with the Federal Railroad Administration and railroad companies once a quiet zone option is approved. Harrington said Rapid City would be the first town or city in the state to implement a railroad quiet zone policy should it move forward. As I have stated numerous times, the RR Redevelopment Project in DTSF was one of the worst negotiated projects in the history of the city. Besides the fact that we probably bought land from the RR that we probably already owned (Federal easements) we did nothing to limit train traffic DT or at least limit the noise. Of the millions we handed over to the RR for basically $62 a square foot dirty land, we didn’t have the vision to set aside some money to create quiet zones downtown. This SHOULD have been a part of the deal. Neitzert said he may wait to see if the ICON has any issues throughout the summer and in the meantime, slow the tempo on composing a new ordinance, but still thinks downtown maybe eventually need to change its key. Ironically its airplanes, trains and first responders that cause the most noise, the decibel level does need to change downtown, funny how this stuff gets killed without little explanation. Kind of like moving public input without an informal public meeting about it. I had the opportunity to go inside one of the bigger condos in the building. While this one did not have a west side patio, it did have several west side windows. I was there for about an hour and the only sound I could hear from outside was a faint police car siren that was driving past the coliseum, but it was so faint you would not even notice it. I’m thinking having the patios on the west side are what may be causing some of the noise issues. My suggestion? Close you patio door. Go with the flat siding, no matter what the architect and engineer may say. Trust me on this one. Consider NOT using a CMAR (Construction Manager at Risk) I would keep the process as open as possible. Use a local contractor that you can trust. Make sure you have plenty of parking. Make sure profits go towards paying down the bonds and not into some mysterious slush fund. Avoid sponsorships from mega hospital complexes and credit card companies. Make sure you build it big enough. Make sure your fire department has a fire truck that can reach the top. And lastly, when the mayor or the city council tells you to ‘just trust them’ do the opposite and question their intentions. Not sure why RC residents want to double their per capita debt (or more) but have it, just remember, there will be less headaches if you keep the process open and transparent. Rapid City residents are voting on a new Civic Center today, I have a feeling it will fail, but honestly I haven’t seen any polling so who knows. “Our economy can only grow with outside money, and that’s a significant source of outside money. Communities today also need to make sure they are paying attention to the quality of life issues. Large employers know this. And that is that they have trouble keeping, retaining and attracting young employee talent. That is only done through the amenities that the city has to offer,” Allender said. Yeah, that was the song and dance we heard from our former mayor about the Denty. While it has been popular and operating well, it hasn’t made a dent in our economy. In fact I would argue it has been a vacuum. Since it’s inception our sales tax revenue has been down and the BID room tax has declined. Why? Well most of the revenue generated from the Denty goes to SMG, promoters and artists (out of town) while the rest of us foot the mortgage which gets ZERO offset from revenue. I encourage RC voters to vote it down and don’t believe the hype. It will never ever pay for itself in NEW growth. What are Sioux Falls taxpayers paying in legal fees? Good question. As you know, the Argus Leader is embroiled in a Supreme Court case with the city over a secret settlement involving the siding on the Events Center. The city has also been involved with class action suits in recent years which involved millions in settlements, but for some reason, we as taxpayers have no idea how much the city spends on these lawsuits, yet in Rapid City, they not only give us the numbers, they even conclude they may lose the case. Over that time, the city has spent $374,200 on legal fees. Now, after deciding to appeal a Jan. 27 ruling by a Pennington County jury that absolved Big Sky LLC of any responsibility for the roads, the city expects to sink another $10,000 to $20,000 into a legal battle with an uncertain outcome against a development company that its owner says has no money. And I think this is a good comparison. Rapid City is a SD city, and the second largest in the State. So why do they see no problem and no legal ramifications with offering this information to their fine citizens, but for some reason we won’t do it in Sioux Falls? Can you imagine if this Mural was painted in Sioux Falls? 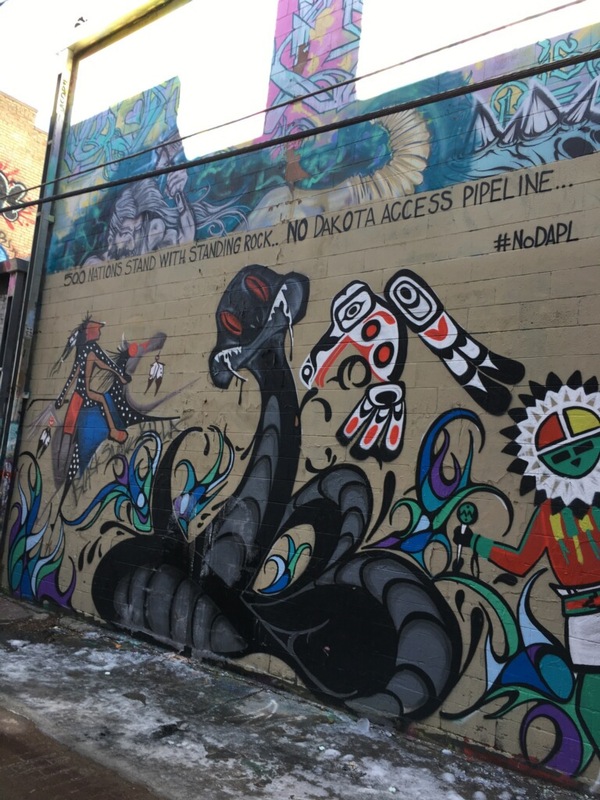 This mural was recently painted in Arts Alley in Rapid City. If Sioux Falls had an ‘Arts Alley’ how do you think locals would have reacted? It’s actually pretty nicely done. This is strictly informational. I noticed that Rapid City approved their 2016 budget the other night, so I decided to crunch a few numbers. I will admit, I would much rather live in SF then RC, but I have friends that live in RC and they love it. They say there is far more recreational opportunities. I still think quality of life is probably better in SF, but that is a matter of opinion. Sioux Falls proposed 2016 budget; $471 Million, 170K residents, $2,770 per person. Rapid City’s implemented 2016 budget; $156 Million, 72K residents, $2,167 per person. I have no doubt there will be some cutting and shuffling going on with the SF budget, but I doubt it will sway to far from the proposed amount. Despite some problems, Allender likes the way Summer Nights builds community. “I step up on stage and I see young people, teenagers, young kids sitting with grandparents or sitting with people who are much older. And they’re all enjoying the same afternoon. They’re all enjoying the same music,” said Joyce. Hey, but if you go walk along the Big Poo after dark to take a hit on a left-handed cigarette, you might find some homeless dancing (or sleeping). Millionaires not welcome. Building a new sports and entertainment complex. Working to improve race relations. Finding ways to ensure schools are properly funded. Forging relationships with businesses to spark growth. This is what you get when you take a sports writer and turn him into a city columnist overnight. Lack of understanding. Municipal governments have NO control over School District funding, and vice versa. While it is nice for the mayoral candidates to weigh in on the school district opt-out in Rapid City or school start dates in Sioux Falls (as our mayor thought appropriate) they really have no control over it. That is NOT a leadership issue, it is a governing/jurisdiction issue. Please, do us all a favor and do a little research on the basic tenants of local government. After all, it is where the big decisions are made, not in publicly supplemented indoor tennis courts.